So depending on how the Kickstarter campaign is going/has gone this blog may be more or less redundant, but I am writing it on the assumption that the campaign has reached its target and the project is going ahead (after all one needs a solid project plan before asking people to provide funding). As an electronic engineer I can handle a sizable amount of the design work myself, but certain parts will need to be contracted out. If the project significantly exceeds its funding target the development timeline should shift up 2 – 3 months as more work can be contracted out. Mechanical: This includes the mechanical housing of the project, the central shaft design and the PCB mounting ring. Software: This encompases the Android & IOS apps, the software that runs on Raspberry Pi and the web interface. VHDL and Firmware: The VHDL is more or less all in place, mostly just needing tidying up and a few tweaks making here and there. The firmware for monitoring and protection will need to be written from scratch. Electronics: The visible electronics in the display modules, the Raspberry Pi and FPGA control circuitry and the power transfer electronics in the slip rings. The mechanical work that needs to be undertaken is not trivial. It can be viewed as three main components: the main box housing, the central shaft and the PCB mounting ring. In the prorotype the shaft was made out of a machined piece of Aluminium, it was fairly heavy, expensive and over-engineered. The shaft needs to switch over to an easily produced plastic design. The shaft will also need redesigning as it will no longer be housing a flat PCB but instead accommodating the PCB mounting ring. The PCB mounting ring will be a hoop, either made of metal or plastic upon which the flex PCB is mounted. It is important that the hoop is strong and accurate in its construction, if the PCB mounting holes are out by half a millimeter the result will be that when the disk spins rather than interlacing you will suffer from superposition. It will also need to be strong enough so that when spinning it does not deform or warp. The box housing for the prototype was made out of steel box section, with steel plates for the bottom, top and rear and veneered panels on the other sides. While not overly expensive this method did result in a woefully heavy device; this needs to be cut down by at least 50%, ideally 75%. The design can either move over to aluminium, or simply us thinner pieces of steel. The majority of the design work this side of the project will be completed externally. While I will provide the specification for the various mechanical parts it really needs completing by someone who knows exactly how to design something to be both economical and reliable. The aim will be to have the design work commence in the fourth quarter of 2017, once the general specification of the wireless power modules and PCB are complete. Globe requires being as accessible to the end user as possible. While almost all of you who have made it to this blog are tech savvy and completely comfortable with the task of remotely connecting to a Raspberry Pi and putting whatever content you want up, a lot of those who haven’t come over here probably aren’t, and that’s okay we will have them covered too! Globe is aimed at more than just us nerds who want a really neat toy. Firstly we need software to run on the Raspberry Pi; a simple local server to interface with the web & smartphone apps. Secondly we will need the web app to allow users to control the content being displayed remotely. Finally we need the Android & IOS (and maybe Windows if anyone actually wants it) apps to allow content to be controlled directly from ones phone as an alternative to the web interface. This work can be started almost immediately after the KS campaign ends. The requirements are unlikely to change and Globe is, at the end of the day, a big old display connected via HDMI to a Raspberry Pi. The developer doesn’t need to do any fancy interfacing or know what happens after the Raspberry Pi. While it’s the sort of thing I could cobble together myself, it would be a lot more professional and refined if completed by someone who really knows their way round app development. Therefore I shall find a reputable looking freelancer who is up to the job. My aim will be to have initial prototypes ready by the new year with a round of updates tweaks and changes by the end of the first quarter and another round by the end of the second if required. I have also budgeted for a post launch update of the software to accommodate any feedback from backers. The FPGA already accepts a 1080p signal, it simply drops every 4 lines (and then a bit) to divide it down to 270×1920. As shown in one of my earlier posts it is capable of handling the 1080p data rate so only a minor alteration needs making there. Mostly this code just needs to be tidied up, optimised and thoroughly tested to ensure there are no bugs left in it before it ships. While I will do all of this myself, I may liaise with someone who is more familiar with publishing professional VHDL to ensure it is as readable as possible for any future development. The work on the VHDL doesn’t need to be completed until the prototype hardware is ready for testing. Since it doesn’t need a huge amount more work doing to it it will exist as a background task to be completed throughout the project. I will however carve out a couple of weeks for it at the beginning of April just in case some major unexpected work does need to be done. The electronics can be viewed as two separate sub projects. The first is the display electronics: the flex PCB upon which sits all the LEDs and drivers, the FPGA HDMI interface and the Pi compute module. The second is the wireless slip rings: the coils, the resonant converters and power regulator modules. The display circuitry will, in some ways, become slightly easier to implement than in the prototype. Because we are switching from a spherical disk PCB to a curved flex PCB the placement coordinates return from polar back to cartesian, all the LEDs will have the same X as will all the other components and their Y locations will change incrementaly. The FPGA and HDMI interface overall design is complete so the only completely new design work will be for the compute module. There will need to be two different versions of the display PCBs; the 540 LED version and the 1080 LED version, but the other electronics can remain the same across all models. The slip ring resonator electronics will be adapted from a Wurth Elektronic reference design. Theoretically not a huge amount will need to change, it will just need to be thoroughly tested to ensure that the power transfer is stable while rotating and the cooling is sufficient at high power. In addition to the slip rings I will also require an equally rated voltage regulator to drop the receiver coils 24V output down to 5/3.3V without loosing too much energy along the way. Theoretically it would be possible to just configure the resonator circuitry to work at the lower voltages BUT the coils themselves can only handle so much current before saturating. I may be able to use different coils (or even custom ones) depending on whether we exceed our target but for now I am planning on sticking with 24V and dropping it down with a regulator. I will handle the design of all of the electronic circuitry, bringing in an additional team member if funding far outstrips the target to help speed up the production schedule. The most pressing task will be to start prototyping the slip rings. A reference design unit will be aquired as soon as possible after funding to allow me to test the power transfer quality when spinning at 900RPM and to evaluate what sort of aditional cooling will be required to reach the higher power limits. The aim will be to have a prototype of the slip rings completed by the end of November to provide plenty of time for thorough testing and modification if need be. The second most pressing task is the Raspberry Pi compute module. Theoretically this shouldn’t be an overly complex task, there are plenty of reference designs out there and I am only using a fraction of its capabilities. I will start of by building a prototype PCB with just the bare essentials: an SODIMM slot for the pi to sit in, a wireless chip, voltage regulators and an HDMI jack. Once this is completed I can move onto designing the single Pi – FPGA PCB. I will start work on this straight after funding and aim to have it completed by the end of October. The third task will be the LED display rings. These should be a straightforward task, because the electronics are mostly the same as the prototype, simply scaled up for more LEDs, but I will need to liaise with my PCB fabrication house to make sure that everything I design meets their capabilities. This should only take about 4 weeks to complete so I aim to start early December and have them completed early January. The fourth task will be the Pi – FPGA PCB. 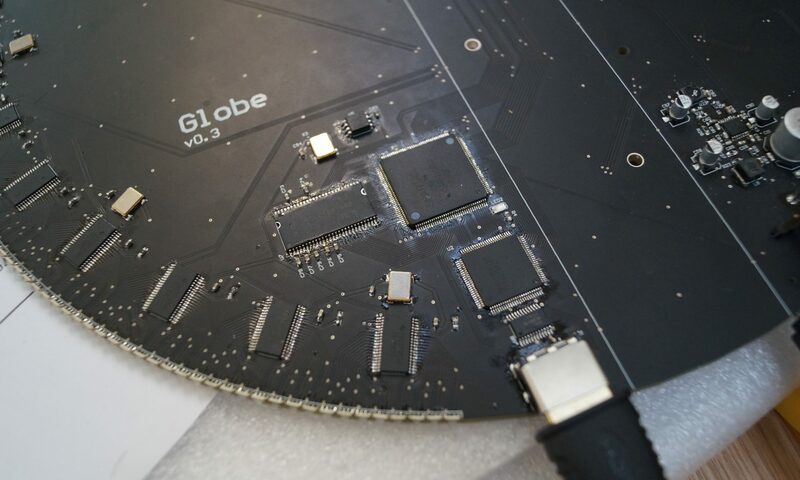 This again should be a fairly straightforward task, essentially taking the logic from the Pi prototype board and the FPGA design from Globe’s prototype and combining them onto one board. This should only take a couple of weeks of work and I will start this straight after the first LED display ring is complete, which should have both of them ready for fabrication before Chinese New Year. The final bit of electronics required will be the motor and power controller. This small circuit will sit down in the housing and will be responsible for monitoring temperature, inertia, tilt and other factors to ensure that Globe is only being run when it is safe to do so. This will only take a couple of weeks to design and will commence once I have decided on the design of the mechanical housing. As the individual electronics come in they can be tested, modifications made and new prototypes created as need be. This should mean that by the end of March there should be all the components ready for testing as part of a full unit.